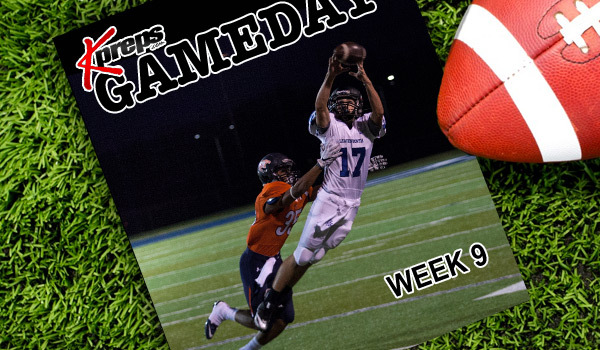 For the second consecutive week, Olathe Northwest will travel to Shawnee Mission South to take on the Raiders. The Ravens defeated South 44-21 last week. Jon Bowman rushed for a pair of touchdowns and Brayden Koch rushed for a score and passed for another as Northwest built a 27-7 halftime lead. SM South has shown improvement this season after entering the season on a 9-game losing streak and having lost 16 of its past 17 games. Blue Valley North has won three of its last four games after a brutal early-season schedule that included losses to St. Thomas Aquinas, Blue Valley, and Bishop Miege. The Mustangs are led by senior quarterback, and Wisconsin commit, Graham Mertz. Mertz has passed for 2,018 yards and 27 touchdowns while completing nearly 60 percent of his passes. Nigel Roberts (38 rec, 559 yards) and Grant Hamel (34 rec, 400 yards) have two of Mertz’s primary targets. SM North’s lone win came Week 3 against Lansing. Dustin McKessor has passed for 882 yards and nine scores this season. Olathe East’s four losses have come to opponents that are a combined 28-6. The Hawks challenged top-ranked Free State to a 38-31 decision two weeks ago in a game that East led 28-10 in the third quarter. Tre’von Kearney has rushed for 691 yards and five scores to lead the Hawks. Quarterback Hunter Thomas has thrown for 1,179 yards and 12 touchdowns; five of those going to TyJuan Lewis who has 478 receiving yards. Wyandotte has dropped five straight games since a 28-0 shutout of Harmon. Four of those five losses have come by 12 points or less. Blue Valley will be a heavy favorite when hosting Shawnee Mission West tonight. The Tigers are looking to rebound from last week’s 47-20 loss to St. Thomas Aquinas. Blue Valley is led by a pair of quarterbacks in senior Luke Bernard and junior Walker Kinney. Bernard has passed for 1,129 yards and 15 touchdowns, while Kinney has thrown for 752 yards and eight scores. Four Tiger have more than 300 receiving yards led by Benjamin Dezube’s 563 yards. Cade Green and Blake Brown are tied with each having a team-high 8 touchdown catches. SM West is going through an uncharacteristic winless season. The Vikings have only played within single digits twice this season with their best performance coming in a 35-28 loss to Lawrence. Olathe South has won two consecutive games after a four-game losing streak in the middle of the season to good competition. Among the Falcon’s losses are No. 1 Free State, No. 2 SM East, and Lawrence, Olathe East and Lee’s Summit (Mo.). Meanwhile, SM Northwest is enjoying a four-win season for the first time since 2011. The Cougars were just 9-37 over the past five seasons entering 2017. Spencer Stewart leads the Cougar offense and has statistically been one of the state’s top passers. Blue Valley West may be playing its best football of the season entering bracket play. The Jaguars picked up their only win of the season, 31-26, over Gardner-Edgerton two weeks ago, then played St. James Academy within one score last week. The issue for West has been a defense that gives up nearly 47 points per game. Olathe North is also playing well of late. The Eagles have won four consecutive games after a 1-3 start to the season. Juniot Daymonn Sanchez (558 yards) and freshman Arland Bruce, IV (462 yards) led an Eagle offense that averages 190 yards per game on the ground. Blue Valley Northwest is faced with the difficult task of slowing down Lawrence quarterback Dante Jackson. Jackson is one of the state’s top dual-threat quarterbacks and all-around athletes. He helps pace a Lion offense that averages 37 points per game. The defense has given up nearly 33 a contest, but will likely be inspired to prolong coach Dirk Wedd’s career in his final season. Northwest is paced by quarterback Payton Hartman who has thrown for nearly 2,000 yards and 12 touchdowns. Tight end Jackson Heath has 54 receptions for 771 yards and six scores. After grinding out close victories in each of the past two weeks, Lawrence Free State will be heavily favored against a winless Wichita North team. The Redskins 42 of their season total 76 points in a 49-42 loss to Wichita Southeast back in Week 3. After starting the season with two consecutive losses, Junction City has won four of its past six games. The Blue Jays three loses have come to Emporia, Topeka High, and Manhattan. While Junction City has officially played seven games, the Blue Jays also scrimmaged Olathe West (new school competing 2018) during Week 7 and won 56-22. Wichita West has won three consecutive games after three straight losses to Bishop Carroll, Wichita Northwest, and Great Bend. The Pioneers best win came 21-15 over Dodge City in the season-opener. Manhattan is a dangerous team entering bracket play. The Indians are ranked No. 5 in the state and have won seven straight since a season-opening loss to Shawnee Heights. Talon Claussen directs the offense from behind center and has passed for 520 yards and rushed for 527 yards. Junior Kevontae McDonald leads Manhattan with 855 yards and 13 touchdowns. East has been shut out in four of its five losses on the season and scored just six points in the other. Two-time defending champion Derby enters as the 5-seed. The Panthers lone loss came 50-20 to 5A No. 1 Goddard. The Panthers had settled on sophomore Grant Adler at quarterback before an injury returned Hunger Igo behind center. Igo has played well but having one of the state’s top backs in Brody Kooser helps. Dodge City has lost back-to-back games against WAC opponents with losses to rival Garden City and Liberal. The Demon’s wins have come against Wichita Southeast, Wichita South, and Hays. Wichita Southeast and Wichita Northwest will play for a second consecutive week. Northwest cruised to a 68-8 victory last week and will be trying to win a seventh straight game since losing to Bishop Carroll to open the season. Southeast’s only win came against winless Wichita North. This is an intriguing matchup because Campus won at Hutchinson 35-7 just two weeks ago. Colt quarterback Federico Harvey passed for more than 300 yards in the win. Campus took advantage of four Hutchinson turnovers, including a fumble at the Colt 1-yard line that led to a 99-yard touchdown pass from Harvey to Braden Haak. Wichita South will get the daunting task of trying to slow down Topeka High running back Ky Thomas. Thomas has rushed for 1,475 yards and 23 touchdowns in his sophomore season. Meanwhile, Da’Vonshai Harden has passed for 1,053 yards and 16 touchdowns. Washburn Rural will make the long road trip to Garden City to take on the 6-seeded Buffs. Rural has won two straight games and three of its past four. Quarterback Michael Schurig has thrown for 1,253 yards and ten touchdowns this season. Meanwhile, Preston Williams has 36 catches for 560 yards and five scores. Garrett Doll has paced the Garden City offense with 1,348 passing yards and 13 touchdowns. Quinton LaPointe leads the Buffs in rushing with 710 yards and seven scores. This is a rematch of the 1 versus 16 match-up from last season. Highland Park almost pulled the shocker, eventually falling to Schlagle 24-16 on a Brayden Soza touchdown run. Senior Ivan Webb has rushed for 2,479 yards this season and 30 touchdowns. Highland Park enters this game on a 33-game losing streak. The Scots’ last win came 60-26 over KC Harmon in Week 2 of the 2014 season. Mill Valley will begin its run towards a third-consecutive Class 5A state championship on Friday at Seaman. The Jaguars are the 9-seed after being seeded 5th last season. Senior quarterback Brody Flaming leads the Jag offense in passing for 1,936 yards and 16 touchdowns. Flaming also leads the team in rushing with 486 yards and six scores. Junior Cameron Young has added 395 yards rushing and seven scores after turning in 1,546 yards as a sophomore last season. Logan Talley has 59 receptions for 812 yards and 8 scores to lead Mill Valley. The Seaman Vikings have lost four of five after opening the season 3-0. Seaman’s losses have come to Shawnee Heights, Manhattan, Washburn Rural, and Junction City. The Vikings are led by Dalton Temmen who has rushed for 594 yards and six touchdowns. The Viking defense only surrenders 215 yards per game. St. James Academy reached the 5A state quarterfinals last season before falling to eventual champion Mill Valley. The Thunder have been even better this year behind a strong rushing attack that averages nearly 230 yards per game. Senior Jack Petz leads the Thunder with 1,021 yards and 15 touchdowns on the season. Lansing enters this contest having lost six of its past seven games with only a 35-13 victory over KC Turner in Week 7. The Lions have only two postseason victories in school history coming back in 2004 and 2005. Shawnee Heights will get a preview of life in the newly formed United Kansas Conference as the T-Birds open bracket play against Leavenworth. The Pioneers enter tonight having lost five of their past six games. Leavenworth is led on offense by senior Devin Johnston’s 545 rush yards and six touchdowns. Quarterback Robert McKinly has passed for 664 yards with 427 of those yards going to Andrew Ativie. Shawnee Heights relies on quarterback Mitchell Lady and running back Trey Jenkins. Lady has accounted for more than 1,200 yards of total offense (634 rush, 570 pass), while Jenkins has rushed for 724 yards. KC Harmon enters this matchup having lost 20 consecutive games and up against arguably 5A’s most talented team. Aquinas has rolled to five straight wins since a tough 27-14 loss to Bishop Miege back in Week 3. Quarterback Will Swanson has passed for 810 yards, rushed for 426 yards, and accounted for 18 total touchdowns. Cameron Jackson has 1,019 yards rushing and 12 scores while averaging nearly 8 yards per carry. Blue Valley Southwest pulled the “upset” of the bracket round last season with a 26-16 victory at Pittsburg. The T-Wolves were the No. 13-seed last season in upsetting the 4-seed Purple Dragons. Southwest isn’t going to sneak up on anyone this year, especially given the numbers quarterback Will Eldridge is putting up. Eldridge has completed 65 percent of his passes for 1,948 yards and 18 touchdowns while adding 343 yards on the ground and six more scores. Billy Bartlett has 74 catches for 974 yards and seven touchdowns and has an outside shot at the Kansas state record of 98 receptions in season. Bonner Springs has dealt with some injuries but persevered to a 4-4 record. The Braves have played three quarterbacks – all of which have passed for more than 450 yards. Pittsburg should be a heavy favorite in this one. The Purple Dragons are 6-2 with losses only to Missouri Class 4’s (Kansas 5A) top two ranked teams in No. 1 Webb City (34-13) and No. 2 Carl Junction (37-17). Quarterback Chase Curtis is back after suffering an injury early on in a 12-7 win over Andover Central and missing the Carl Junction game. Backs Jhalani Long and Brandis Evans will pace the Purple Dragon ground attack. Washington enters with wins over Wyandotte (30-18) and Harmon (16-8). The Wildcats are 0-3 all-time in postseason appearances. Sumner has won three of its last four games after a 1-2 start. The Sabres picked up a 35-18 victory over Washington last week on senior night. Turner’s wins have come over Washington (28-6), Bishop Ward (54-12) and Wyandotte (36-26). The Golden Bears are led by sophomore Jaylin Richardson who has 1,035 yards rushing and nine touchdowns. Top-ranked Goddard will begin its trek back to the 5A state championship game begins with a home game against struggling Salina Central. The Lions have been playing without senior QB Blake Sullivan for a couple of week due to an injury, but he returned during last week’s 48-14 victory over Newton. Sullivan carried five times for 95 yards and three touchdowns in the win. Freshman Kyler Semrad layed well in Sullivan’s absence – passing for 404 yards and seven touchdowns in the past three games. Salina Central has lost 17 straight games. Andover will travel to Valley Center for a second consecutive week. Last week, the Trojans blasted Valley Center 48-13. Andover led 34-0 at halftime behind a standout performance from freshman quarterback Eli Fahnestock. Fahnestock passed for 311 yards and three touchdowns and added three more scores rushing. Salina South picked up its second win of the season by beating cross-town rival Salina Central, 38-14. The Cougars will travel to Liberal to take on a Redskin team that has won three straight games. Coach Jason Dunlap has led Liberal to six wins in his first season – the school’s most since 2005. The Redskins are led by Syris Dunlap at quarterback. Goddard-Eisenhower has won three straight games after a 0-5 start. The Tigers have posted wins over Valley Center, Andover, and Arkansas City in the past three weeks. Quarterback Tyler Trudo rushed for 298 yards and 5 touchdowns last week against Ark City. For the season, Trudo has rushed for 1,123 yards. Great Bend rebounded from a disappointing loss to Liberal with a strong defensive effort in a 20-7 win at Garden City. The Panthers fell 23-21 to Liberal the week prior after holding a 21-7 lead in the fourth quarter. Koy Brack leads the Panther offense with 844 rush yards and 949 passing yards. Bishop Carroll will begin bracket play by hosting Ark City. The Golden Eagles got four touchdown passes from Braden Howell last week in a 30-22 victory over rival Kapaun Mt. Carmel. Ark City fell 49-20 to Eisenhower. Bulldog quarterback Cevin Clark has passed for 1,310 yards and 11 touchdowns this season, but has been intercepted 14 times. Kapaun will host Emporia in an intriguing contest. Kapaun has lost three of its past four after a 4-0 start to the season. The Crusaders’ only win during that time was a quality 28-27 overtime victory at St. James Academy back in Week 7. Kapaun has suffered losses to good teams in Wichita Northwest, Wichita Heights, and Bishop Carroll. Emporia finished 4-4 through a tough schedule filled with Centennial League opponents. Last week, the Spartans upset Shawnee Heights, 19-14. Jace Stewart leads Emporia with 706 passing yards and 441 yards rushing with 12 scores. Gabe Galindo leads the Spartans with 699 rush yards and two scores. Ryan Kelly got his first win as Topeka West head coach back in Week 6 as the Chargers beat Highland Park, 43-26. Maize has won five straight since a 60-28 loss to Derby. The Eagles are 7-1 and ranked No. 5 in Class 5A. Senior Dalyn Johnson led the Eagles with 113 rushing yards and two scores in last week’s 14-13 victory over Hutchinson. Newton’s improvement under coach Chris Jaxx has produced a three-win season. The Railers had won four game total the previous three years. Newton posted wins over Eisenhower, Salina Central, and Arkansas City this season. Wichita Heights has just one loss at full strength after missing several starters in losses to Olathe North and Wichita Northwest to open the season. Since then, the Falcon’s only setback came 35-14 to Bishop Carroll in Week 7. The game was tied until quarterback K’Vonte Baker left with an injury.